Banana breakfast bars make a quick and easy breakfast or afternoon snack. Baked to perfection with simple ingredients like yogurt, oats, and bananas. Even though I didn’t grow up eating bananas [thanks Mom] we always have them in our house. They are the main ingredient in every smoothie and the perfect grab n’ go snack when we are headed out the door for the park. Because the boys are not satisfied with just ONE banana, I came up with these simple banana breakfast bars as an alternative when breakfast is light, lunch is a few hours away, and the boys need something heartier for their toddler brunch [aka snack]. The secret, protein-packed ingredient? YOGURT! Which actually outdoes bananas as a favorite food in this house. Which is A-OK with Mom because of all the health benefits yogurt offers their little tummies, brains, and bodies! Sidekick #2 sneaking a bar when I was taking photos. Oh look… he stole a banana slice too! Now if you haven’t baked with yogurt, I highly encourage you to do so! Honestly, I’m not sure of the ratio when you substitute yogurt for fats and liquids in cooking. I’ve found it’s NOT an even cup-for-cup exchange. 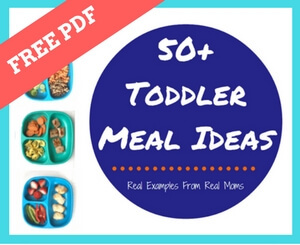 But you play around with a favorite recipe and find the right combination, your baked good will come out super moist, and packed with plenty of essential nutrients [protein and calcium to name a few] growing toddler bodies need! And mom’s and dad’s need too. While I used a banana flavored yogurt for extra banana punch, you can use plain, plain Greek, or vanilla yogurt too! Preheat oven to 350. In a large mixing bowl, beat sugar and butter. Add egg, salt, banana and yogurt. Mix well. Add remaining ingredients until well combined. Spread batter in 8x8 inch pan. Bake for 35 minutes. Let stand at room temperature for 10 minutes before serving. Serve with yogurt or sliced bananas as a topping. For more information about baking with yogurt [specifically Greek yogurt] be sure to visit the Milk Means More MI Greek Yogurt Pinterest Page. I’d love to hear from you if you make this recipe and play around with the fruit and yogurt flavor! Next up: STRAWBERRIES. Since it’s almost berry season here in Michigan! I made this today and it is delicious! How do you go about keeping it staying fresh? In the fridge? How long? Does it freeze well? Fridge for sure! I’ve never frozen but I think they would freeze well given the ingredients. So glad you liked! Can i use honey instead of brown sugar? Hiw much honey? 1/2cup? I️ had to use steel cut oats. Hope this is ok? Where is the nutritional content per serving?